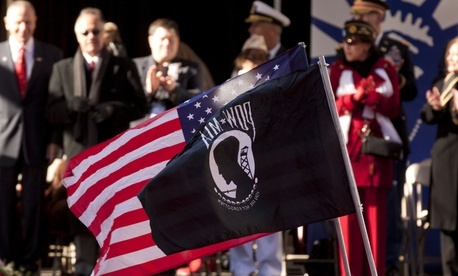 Here's a statistic: 83,000 American service personnel are still missing in action. These soldiers are assumed dead, but are still unaccounted for. They rest in unmarked graves in foreign countries, or are taking on sediment at the bottom of the ocean. 73,500 of them fought in World War II; 9,645 in the wars since. It doesn't take a lot math to conclude that several dozen identifications per year is barely a scratch on an 83,000 total. The problem isn't that DOD doesn't know where the remains are. The problem is institutional—a bureaucracy using slow, outdated processes in lieu of faster scientifically backed techniques. "DOD's capability and capacity to accomplish its missing persons accounting mission is being undermined by long-standing leadership weaknesses and a fragmented organizational structure," a 2013 Government Accountability Office report concluded in summary. Many of the unfound lie in mass graves in the countries they died fighting in. Others are buried and are memorialized by gravestones declaring them known only to God. The room for progress is ample. Congress has mandated that the Defense Department start matching 200 soldiers peryear by 2015. And earlier this year Defense Secretary Chuck Hagel announced that the two offices that oversee the identifications (DPMO and J-PAC) would be consolidated into one. "If we put together a better institution, organization, better management, better structure, better use of our resources, then I hope we'll be far more effective in being able to accomplish the mission of identifying these missing remains and getting these missing remains brought home to the families," Hagel told reporters in March. The reorganization is set to occur sometime in 2015,according to ProPublica.